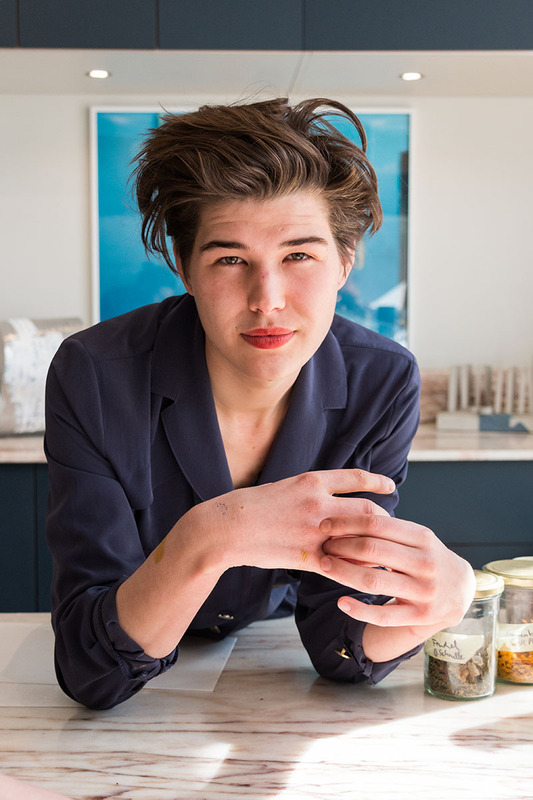 “In articles I am always referred to as Kristiane Kegelmann, the patisserie chef,” Kegelmann says. The artist may have learned her craft in the field of patisserie and worked for several years in Vienna’s KuK Hofzuckerbäckerei Demel, but it is not through just this that she wishes to be defined. With her edible sculptures, Kegelmann frees herself from the rigid and restrictive world of patisserie, redefining the boundaries between contemporary art and the culinary arts, and brings her delectable geometric food creations into the gallery space. She is at once artist, patisserie chef and sculptor, dedicated to defying expectations and delighting her guests. 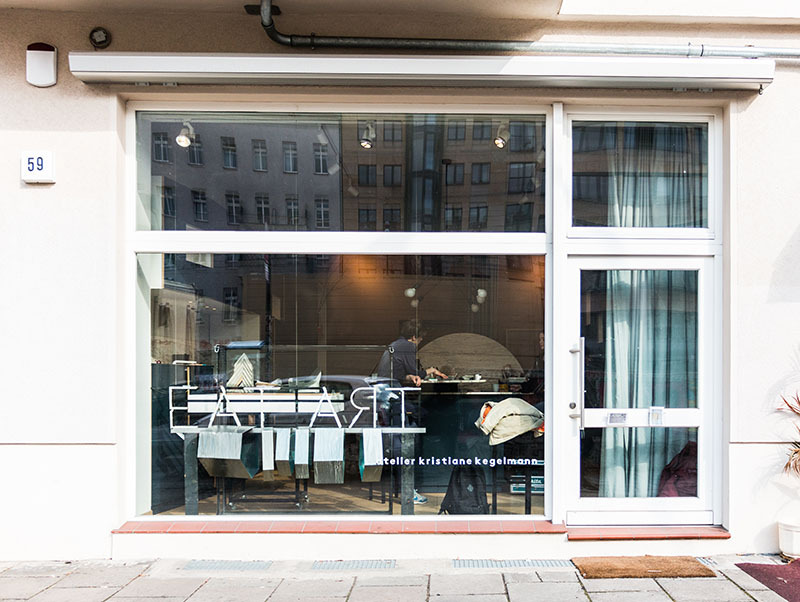 Such a plurality to her craft is mirrored by her studio space in Berlin’s Prenzlauer Berg neighborhood. 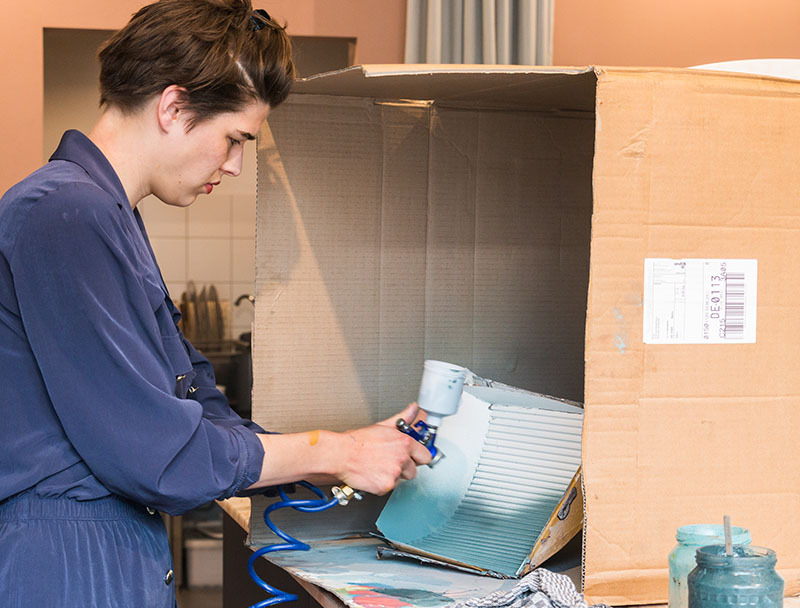 Partly funded through a KickStarter campaign, the space is a fully functioning kitchen designed by her befriended designer Cäcilia Verweyen to enable her to experiment with ingredients and create both large-scale and small-scale sculptures. When we arrive, she is working on a piece to be shown two days later at Lage Egal. Despite this upcoming deadline, there is an aura of effortless calm and at no point does it feel like she is rushing to get rid of us. The result of extensive knowledge about her material and a devotion to crafting both visually and gustatorily exquisite works, she appears assured in her abilities. 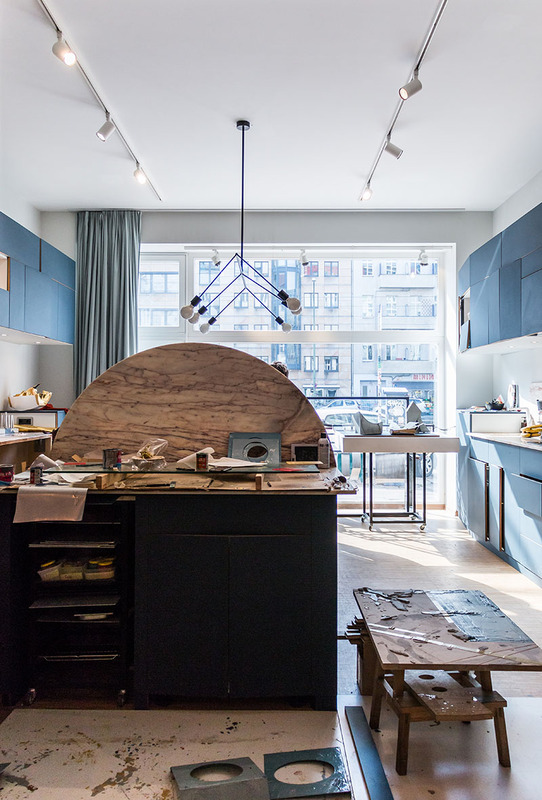 The kitchen studio space is far from bare, but everything does have its place, allowing Kegelmann to work in a methodical and smooth sequence of planned steps and creative energy. 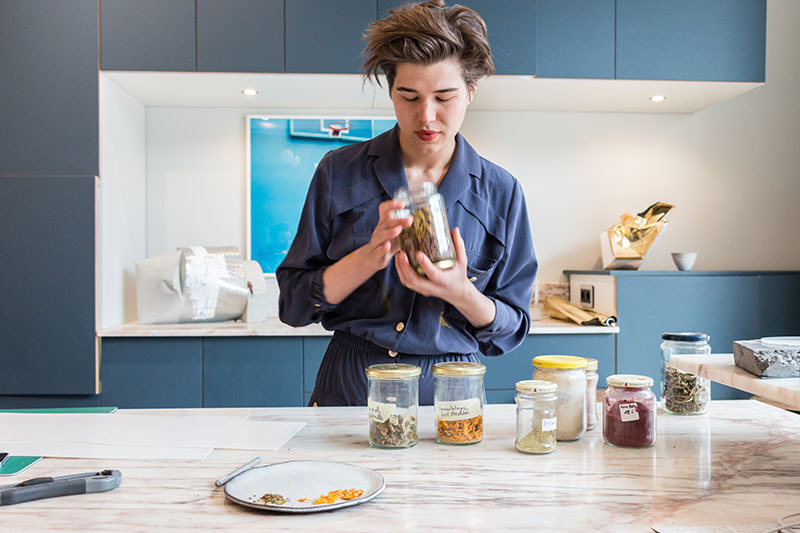 Jars filled with dried fennel and other experiments line the cupboards; chocolate is tempering in the oven ready to be used; and concrete materials that she hopes to incorporate into future projects sit around the edges of the studio. Everything in the space is coordinated through a muted colour palette, and the artist, in a dark navy jumpsuit, befittingly matches her setting. 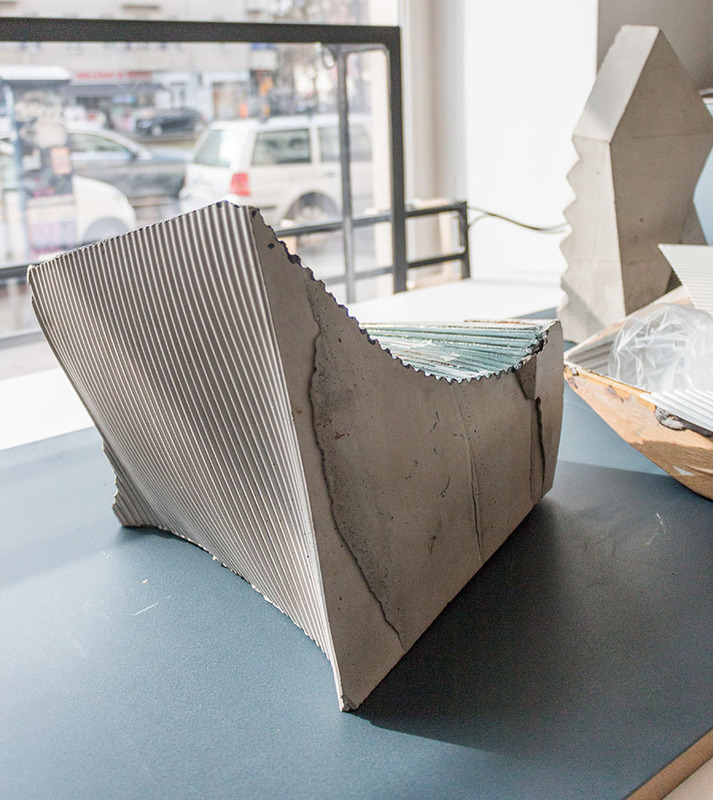 The works Kegelmann is scheduled to show at Lage Egal will be constructed from two concrete elements that she has exhibited before. She demonstrates the beginning of her process, spraying a mould that is evocative of a Doric column fragment with natural food colouring and then coating it with chocolate. Later she will fill it with nuts and other ingredients about which she remains slightly unsure. This food element will be displayed atop a concrete structure in the gallery. Kegelmann resists attributing her inspiration to architecture, but many of her works are evocative of architectural objects. She displays mousse-like blocks of pastel and gold coloured goats milk and blackberry creations on wedges of concrete. She places pieces of sourdough wrapped in foil alongside concrete also wrapped in foil. Often her works take up the whole space; small geometric, muted coloured pralines are hung like beads on a necklace, from wires that start in the ceiling of the gallery. The final sculptures are typically a hybrid between durable and edible materials. “I like concrete, I like steel, I like wood. I find pieces of wood and I try to work with it,” she explains. Although Kegelmann has no formal training or tools to work with these materials, she still manages to craft architectural structures that perfectly balance the delicacy of her edible creations—and that outlast the consumable components. Her works always possess a transience and ephemerality. The act of eating, and in a sense destroying, is encompassed in their meaning and it is what primarily drives Kegelmann as she wants to produce extraordinary taste experiences. She explains that she only uses foods that she would want to eat and that the quality of her ingredients is incredibly important. “I couldn’t just go to the supermarket and buy ingredients and work with them,” she says. “I like to work with farmers and people I know so I am sure they are produced well.” Such a dedication to quality is born from a shared focus on taste and the visual. “I couldn’t work with edible materials and not let them be eaten. I don’t just work with foods because they’re nice to sculpt and then want them to be there for ever,” she says. Her works are about transformation, firstly existing to the eye, often hanging in the gallery, and later they become objects of taste. Kegelmann embraces the inevitability of her work perishing and consequently resists the notion of immortality that is typically associated with the artist and their creations. Rather her works exist in the present and gather meaning from the sensorial indulgence that they provide their audience. The role of the spectator is also very important in her work. Rather than initiating action, Kegelmann prefers to stand back and observe how people interact with her food within the gallery space. “It shows a lot about characters of people,” she says. Visitors are usually aware that they will be able to eat the works, but there is still an understandable sense of anticipation associated with devouring and spoiling the sculptures. Recently, she began working with fish, seeds and vegetables, departing from the sweet ingredients that dominated her past. “I worked in patisserie for a long time and people always expect sweet stuff, so I like to completely disappoint their expectations,” she admits. In addition to playing with the subversion of assumptions, Kegelmann also enjoys searching for recipes and materials that diverge from her background. Through eating her work, it is possible to understand why the artist distances herself from other food artists by emphasising the significance of tasting and not just looking. 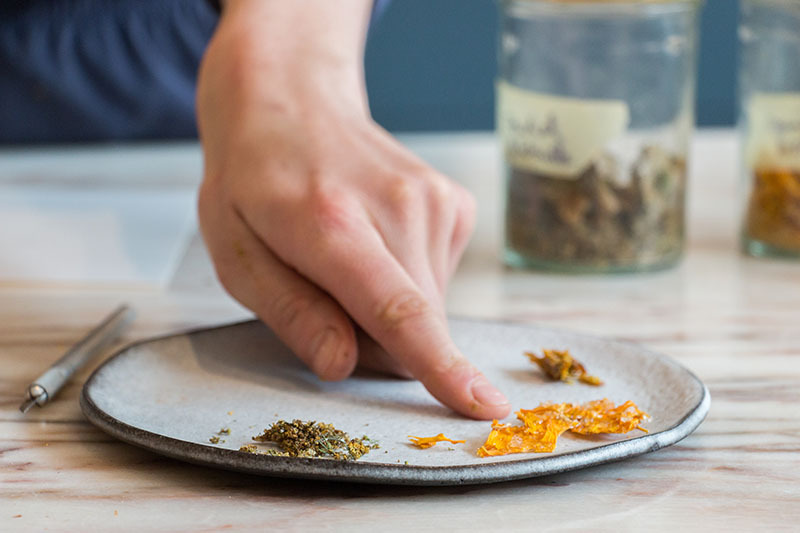 The final stage of transformation helps you to fully understand her creations, from the story of the ingredients to the skill of Kegelmann’s craft. Her sculptures are not like normal works of art that assert a physical distance from the spectator, and hence should not be treated as such. Rather they are transitory, participatory, almost poetic tributes to food that invite visual pleasure and an amazing taste experience. In the coming months, Kegelmann will show her work at Paris Food Art Week and also hopes to install a sculptural piece in public space. She remains unsure of how to position the piece so that the public know it is intended to be eaten, but is excited by the idea of installing her work at a place where people are not previously aware of the nature of her sculptures. This will starkly contrast the audiences of her previously shown work and reveal the universal accessibility of her artistic practice and of the ability to take delight in food. Ultimately, Kegelmann seeks to provide a space—whether this be in the gallery or public space—for indulgences and pleasures. Her work subverts both a typical treatment of art objects and our perversely modern eating habits and attitudes toward food. “Food is something very precious and my works are a homage to this,” she says. Her sculptures are created to be destroyed, not to be preserved, and yet despite possessing this condition of approaching perishability, simultaneously provide the time to savour and time to enjoy.